Words are everywhere-- on labels, magazines, sign posts, t-shirts-- everywhere. And as much as David Chance would like to hide from them, he can't. Words keep leaping off objects around him, forming messages in his mind. But how is this possible? Has his brain suddenly taken an evolutionary leap forward, or are the mysterious messages proof of divine intervention? From a 5-star review: “John Michael Hileman's latest novel will not disappoint his fans--and is sure to increase his fan base exponentially, as the buzz spreads about this talented Maine writer's second work. The story line leaps to a quick start from the very first sentence and doesn't slow its pace once. Hileman has the gift of creating intricate, tightly woven subplots for a cast of characters who come to life with each paragraph. Protagonist David Chance is a likeable everyman. There is nothing special about him, nothing to set him apart from people we encounter every day...except for the sudden onset of an inexplicable ability--a super power of sorts--his ability to foresee the future through randomly strung-together words that form messages only he sees. Stir into the mix the fact that Chance is a devoted family man with a typically complicated, somewhat dysfunctional family dynamic , and you have a character line up ready-made to provide richness and depth under Hileman's skilled pen. David struggles to understand the messages he receives. How is this happening? What exactly is happening? Is he simply and unabashedly crazy, or is there a rational explanation for what is occurring? As the plot twists and turns, the reader develops a bond with David, his family, and friends, and tries to second guess the outcome. 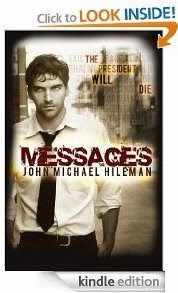 Messages has all the hallmarks of a true political suspense bestseller. There is just the right degree of suspense, mixed in with a few hints to encourage the reader to "solve" the mystery.